Mottram Hall provided a beautiful venue for The AA's corporate activity days, second country pursuit event. The sun was fighting with the clouds to come out but everyone was excited for the range of activities we had to offer including archery and lasers shooting. To start the day, teams were selected and team names decided on. Competing for the Team Challenge Company Winner’s Trophy and hopefully not the Wooden Spoon were; Roy's Rovers, The Champions, The Misfits and Supergran. The first activities of the day were Rollerball and Archery. On the Archery lots of points were handed out with Roy's Rovers enjoying the benefit of Tony, who turned out to be a pro, as well as Roy who scored 40 points on his is first hit despite his lack of sight. Tracy however, couldn't be helped - managing to hold the bow backwards...! 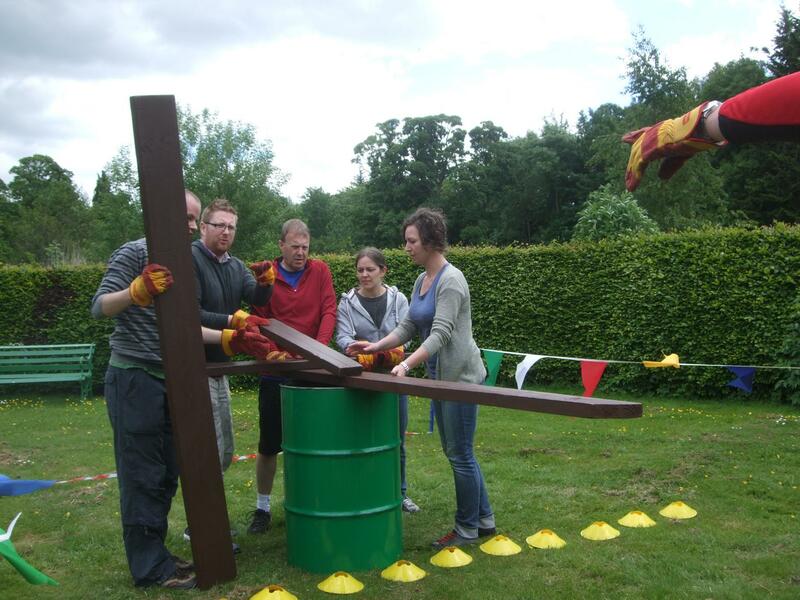 Over on Rollerball, the competition was fierce as the team built structures to keep their golf ball moving for the longest time. The Misfit's design looked particularly promising but Supergran stole the game with a wopping 38 seconds! Next up for the teams were Mini Highland Games and Chip Shot Golf. Success on the Golf proved more difficult than expected with a lot of balls making it outside the range. However, Lisa proved to have a good technique, just lacking in ability to aim, allowing The Misfit's to take advantage of Maureen's skills, that although her husband didn't think we're up to much, helped her team score 110 points. On the Highland Games, Welly's were being thrown, although not all equal and some questionably small Welly's being brought into play. Tossing the caber called for complete dedication and Tony came top again scoring a perfect 10. The Laser Clay Pigeon Shooting saw the 4 teams come together to compete against one another. Once they worked out the right way to hold the guns, practise got underway and it was soon time for some challenges. Lots of bishops were fired and in the end the scores were very close, but The Misfits proved strong again. Our final challenge was the Catapult which got the teams building again, this time to launch their golf ball as far as possible. The Champions thought they had their plan sussed within minutes quickly rigging up a very flat catapult. However, it wasn't long before this mutated. Supergran weren't quite so lucky with their plan and despite using their initiative and using some contraband materials; they therefore, failed to make it onto the leader board. The Misfits plan was on the other hand strong, fuelled on by their unstoppable competitiveness that Anne had brought to the whole day. In the end, Roy's Rovers had a phenomenal shot beating the other teams by miles and no one could argue against their win. The final scores saw the wooden spoon go home with the Supergrans. Managing to keep off the last spot, but not quite live up to their name, The Champions, who took third place. Second place, with a great score of 4400 points went to The Misfits. Way ahead though with 5000 points were our winners, Roy's Rovers who celebrated taking home the Team Challenge Company Winner’s Trophy. We hope you enjoyed your day as much as we did and look forward to seeing you again! A brilliant day and fantastic group! Roy's Rovers were great throughout the whole day! well deserved winners!